Assent vs. Consent – What’s the Difference? Home » Assent vs. Consent – What’s the Difference? The difference between some words can seem trivial. English has many words that seem superficially similar at first glance, even if they have important differences in meaning. Assent and consent, for instance, each signal agreement with something, but there are subtle differences in connotation that can change the meaning of an entire sentence. Depending on your audience, using the wrong word could damage your credibility or even unintentionally mislead someone. Continue reading to learn more about these confusing words. In this post, I will compare consent vs. assent. I will use each of these words in at least one example sentence, so you can see them in context. Plus, I will show you a helpful memory tool that you can use as a reminder of whether consent or assent is correct. What does consent mean? Consent is a noun and a verb. As a noun, consent means permission for something to happen. Often, a patient must give consent before medical treatment can begin. A parent or guardian must give consent for children under the age of 18. Medical professionals should ensure that patients understand the treatment for which they grant consent. As a verb, consent means to grant permission for something to happen. Each client must consent to treatment before an intervention can begin. “I do not consent to this exile!” cried the priest as he was dragged from the throne room. What does assent mean? Assent is also a noun or a verb. As a verb, it means to agree with an opinion. I assent to the terms of this contract, and will follow them to the best of my abilities. Karen assented that Jerry’s idea was probably the best way to move forward. As a noun, assent means agreement with an opinion. Jack signaled his assent with a slow nod of his grizzled head. We have not given our assent to the plan, and should it be adopted, we would not follow it. This, of course, isn’t interesting in and of itself. It just shows that one word is more popular than the other. Since each word has its own specific meaning and usage case, the popularity of one or the other shouldn’t affect your word choice. You still need to choose the right word for your sentences. Assent or Consent? The primary distinction between these two words is that to assent is to denote agreement with an opinion. If you assent to something, you agree with something that someone has said. To consent is to denote agreement to let something happen. If you consent to a surgery, you are allowing the doctors to operate on you. Additionally, assent can have a connotation of enthusiasm. If the chambers of congress loudly assent to a vote, it could be read that these congressmen are pleased with the outcome—even enthusiastic. Consent, in many cases, does not have a similar connotation. It simply means to acquiescence and let something happen. Taking our doctor example from above, you might not be excited about a surgery, but you reluctantly consent to the procedure because you know it is your only path forward. As mentioned above, traditionally, assent carries connotations of stronger agreement than consent, which suggests acquiescence and little more. Assent means agreement with an opinion. Consent means permission for something to occur. Since assent and agreement each begin with the letter A, you should always be able to remember that assent means agreement. Is it assent or consent? These terms might deal with similar circumstances, but there is a distinction in meaning. Consent means permission for something to happen. Assent usually signals stronger agreement than consent. 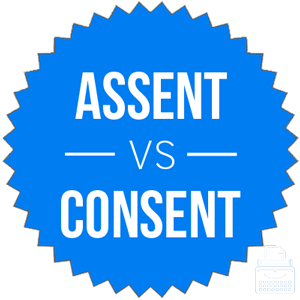 1 What is the Difference Between Assent and Consent? State of the Art vs. State-of-the-Art – What’s the Difference? Backup or Back up – What’s the Difference?